Can Michelle Obama Save Fashion Retailing? How much has Michelle Obama shaken up the fashion world? Well, name one other woman whose dress receives a birthday tribute. In January, the clothing retailer White House Black Market set up a swag suite at the Sundance Film Festival. The company dressed a mannequin with a black-and-white leaf print dress like the one Obama once wore on The View. Mo'Nique, the comedian and actress, recognized the outfit. And since it happened to be the First Lady's birthday, of course it was Mo'Nique's duty to belt out "Happy Birthday," to a mannequin, in a crowded room. Mo'Nique better motor to the store. In spite of the recession, Michelle Obama's outfits are flying off the racks. That $148 dress is still a hot seller at White House Black Market, almost 11 months after Obama wore it on The View. The dress sold out at the 327-store chain within 48 hours of her appearance; later, shoppers were willing to endure a 2½-month waiting list for it. In fact, the First Lady has been a one-woman stimulus package for the suffering fashion retail industry. Designers, store buyers, shoppers and stock investors are all watching her every move. And she has been in the White House barely 100 days. "She's the first thing my clients want to talk about," says Jennifer Black, president of Jennifer Black & Associates, a retail equity research firm. "She's a huge deal. And I don't think this is a short-term thing. Sometimes you get a flash in the pan, but that's not going to be the case with Michelle Obama." No retailer owes more to the First Lady than J. Crew. In October, amid the Sarah Palin $150,000 wardrobe scandal, Obama wore a $340 J. Crew set on the Tonight Show. "Ladies, we know J. Crew," she said to the studio audience. J. Crew's Web traffic shot up 64% the next day, and the yellow blouse, cardigan and skirt she wore on the show sold out immediately. Later she wore a J. Crew camisole, cardigan and pencil skirt in the March 2009 issue of Vogue. A hefty wait-list immediately started for all three fall items. The First Lady might save another retailer, Talbots, from extinction. The company lost $128.4 million, excluding special charges, in the three months ending Jan. 31, compared with a $7.1 million loss the previous year. Same-store sales fell 14.2% for the year, and an incredible 24.6% in the fourth quarter. Over the past year, the company has desperately tried to reposition itself from a frumpy brand for the over-50 set to a stylish look for the new sophisticated 40-something. 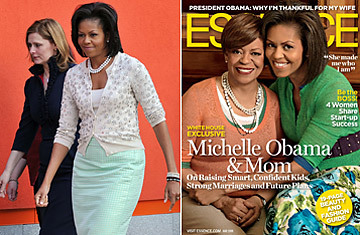 In early April, the May issue of Essence hit newsstands, with Obama wearing a $169 Talbots silk dress on the cover. It was a marketing godsend. "We'll now be able to change people's perceptions of Talbots more quickly than we otherwise would have," says a hopeful Lori Wagner, chief marketing officer for Talbots. The company just needs the First Lady to keep wearing its clothes. "If Michelle Obama consistently shows up in Talbots dresses, it can definitely be a game changer," says Black, who adds that the Essence cover has already driven more traffic to Talbots stores. Macy's fashion director Nicole Fischelis says that bright-colored cardigans, sleeveless sheath dresses  you might have heard that the First Lady likes to show off her arms?  and the pencil skirts Obama favors are among the best-selling items in the store. If you could choose any woman in the world to wear Macy's dresses for a week, would it be the First Lady? "Without a question," Fischelis responds. Bloomingdale's is highlighting sleeveless sheath dresses in its catalog and stores. "She influences the decisions of every single buyer that goes into a showroom," says Stephanie Solomon, fashion director at Bloomingdale's. Although the First Lady has sparked retail sales for her chosen brands, it's too early to anoint her a savior. "Michelle Obama hasn't done enough to significantly change the financial performance of J. Crew and Talbots," says Betty Chen, retail analyst at Wedbush Morgan Securities. J. Crew's same-store sales fell 13% in the fourth quarter of 2008. The company lost $13.5 million, compared with a $25 million profit in the fourth quarter of 2007. Talbots has updated its merchandise to fit its repositioning as a younger company. According to Chen, however, the company is too indebted to revamp its musty stores, a big hindrance to its turnaround plans. In an April research report, Brian Tunick, retail analyst at JPMorgan Securities, listed his top 10 myths that "along with the Easter Bunny, we're not sure we believe in either." No. 4: The Michelle Obama Bounce. See pictures of the fashion of Michelle Obama.